Nikon D800 camera, Nikon 600mmf4 lens, Wimberley head on a Really right stuff window mount, ISO 800, f11, 1/3200 second, exposure compensation = -0.7 Aperture priority, White Balance – sun. 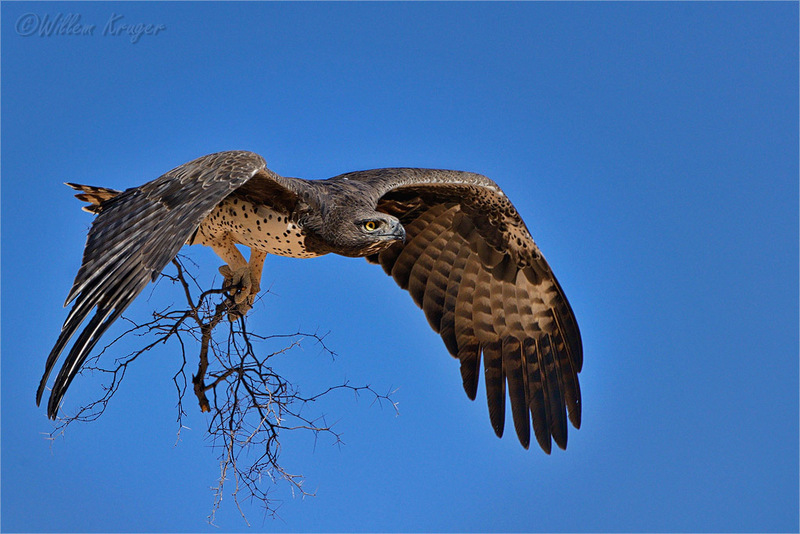 The Martial Eagle is a very large eagle, with a length of 78–96cm (31–38in), weight of 3–6.2kg (6.6–14lb) and a wingspan of 188–260cm (6ft 2in–8ft 6in). The body underparts are white with blackish-brown spotting. The female is usually larger and more spotted than the male. They build their nests in large trees, often placing them in the main fork of tree at 6–20 m (20–66 ft.) off the ground, though nests have been recorded from 5 to 70m (16 to 230ft) high, in the highest cases on top of the tree canopy. Often trees used are on the sides of cliffs, ridges, valley or hilltop, with one nest having been found within a cave. The nest is a huge construction of sticks. In the first year of construction, the nest is 1.2 to 1.5m (3.9 to 4.9ft) in diameter and 0.6m (2.0ft) deep. After regular use over several years, the nests can regularly measure in excess of 2m (6.6ft) in both diameter and depth. Martial Eagles have a slow breeding rate, laying usually one egg (rarely two) every two years. The egg is incubated for 45 to 53 days and the chick fledged at 96 to 104 days. Despite increasing signs of independence (such as flight and beginning to practice hunting), juvenile birds will remain in the care of their parents for a further 6 to 12 months. Due to this long dependence period, these eagles can usually only mate in alternate years (Wikipedia). The female remains in the area and receives prey from the male for about 50 days. After that she hunts or brings prey to the nest herself and the male seldom appears. The young one is closely brooded in its first few days, but after fourteen days the female does not brood it except at night. The young bird, after making its first flight (at about 100 days), may return to roost in the nest for some days, and thereafter moves away from it. 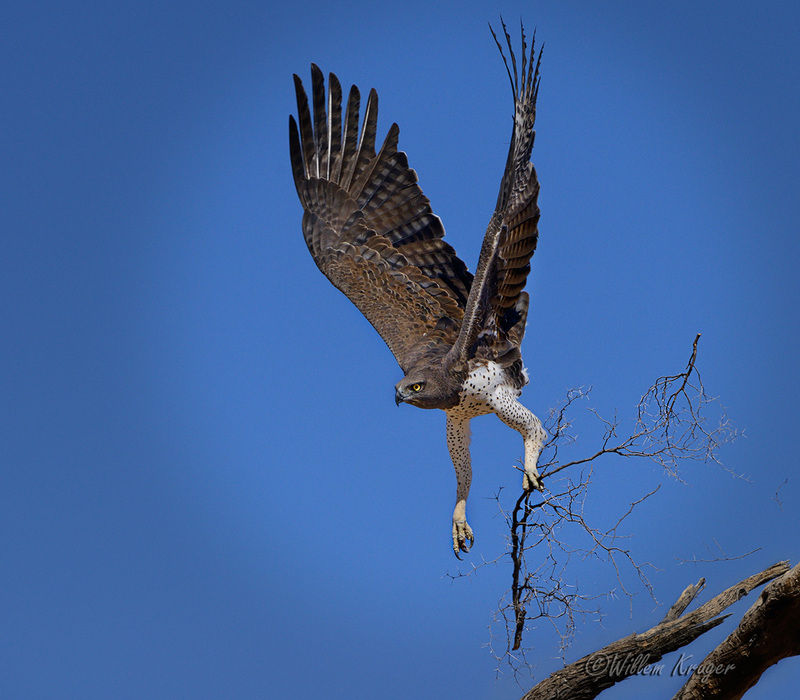 It remains loosely attached to the nest site for some time, and may be seen not far from it for up to six months (http://www.krugerpark.co.za/africa_martial_eagle.html). Until next week – keep on shooting. This entry was posted on January 12, 2014, 11:52 am and is filed under Willem's Weekly Bird Photography blog. You can follow any responses to this entry through RSS 2.0. You can leave a response, or trackback from your own site. Willem, I really enjoyed those Martial images – what a wonderful sighting! these are awesome avian predators. Hi Michael – thanks and it was a very special sighting. It was worth the 2h waiting time. Willem, can you please contact us via e-mail. Whe are interested in your photos, for publishing in our magazine. Thanks for your comment – I did send you an email as requested.